The #SundaySupper Tastemakers are preparing for the holidays! We've been busy in the kitchen testing our favorite Thanksgiving recipes. In case you missed it, last week we featured our favorite Holiday Side Dishes, and this week we are bringing our scrumptious holiday dessert recipes to the party! Stay tuned for next week too, because it is devoted to using up those inevitable leftovers in the tastiest ways! With Thanksgiving around the corner I started dreaming of that Pecan Pie, but Madison is all the way on the other side of the country, and I'm not a pie maker. So what's a pecan pie craving girl to do? Make bar cookies of course! Easy peasy! 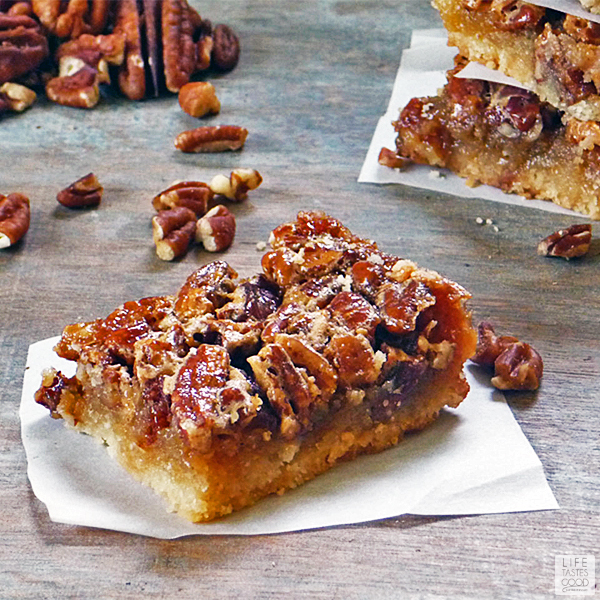 I like these pecan pie bars much better than in the pie form. They are so much easier to make (have I mentioned I am pie crust challenged? ), and the shortbread crust is so delicate and buttery it just melts in your mouth. It pairs nicely with the pecan and caramel topping it's like they were made for each other. You won't miss the pie crust and that is the truth! Be sure to use a 10"x15" jelly roll pan for this recipe. If you don't have one, you can pick up a foil one on the cheap, and it makes clean up a breeze in case you have drips. It's important to use the right size for this recipe. Line the pan with parchment paper for best results. Be sure the parchment paper hangs over the sides for easy handling. When making the shortbread, a food processor makes quick work of it, but you can use a pastry cutter or even a couple of knives to cut in the butter. Speaking of butter, make certain the butter is chilled before using. Preheat oven to 350 degrees. Grease a 10" x 15" Jellyroll Pan and then line with parchment paper being sure to have parchment hanging over all sides of the pan. Buttering the pan allows the parchment to stick. Do not butter the top of the parchment. If you don't have a 10" x 15" Jellyroll Pan , you can pick up a foil one on the cheap, and it makes clean up a breeze in case you have drips. It's important to use the right size for this recipe. In the bowl of your Food Processor combine 3 cups all-purpose flour, 1/2 cup sugar, and 1/2 teaspoon salt. With the Food Processor running, feed 1 cup cold, diced butter through the tube. Once all the butter is processed with the flour mixture it will resemble coarse crumbs. If you don't have a Food Processor you can cut the butter in with a pastry cutter or using 2 butter knives. Keep cutting until the mixture resembles coarse crumbs. Press the mixture evenly into the prepared pan, and bake in the pre-heated oven for 20 minutes. Meanwhile, in the bowl of the Food Processor add 4 eggs, 1.5 cups light corn syrup, 1.5 cups sugar, 3 tablespoons melted butter, 1.5 teaspoons pure vanilla extract, and 1/2 teaspoon salt. Pulse about 30 seconds to mix well, then fold in 2.5 cups chopped pecans. Spread the filling evenly over the crust once you take it out of the oven. Tip: Place the pan on a larger sheet pan lined with foil, just in case it spills over, to make clean up a breeze! Bake for 25-30 minutes in the preheated oven. When done the filling will be set nicely - no jiggles! Allow to cool completely before slicing. Enjoy! Marion, every time when I saw related pecan pastries, it make me drool and jealous. Pecan is so nice yet it is extremely expensive in Asia. Make me want to spend some money to get hold of pecan and make this. Cheers and have a nice day! from DBB and pin. I think I'm going to make these for Thanksgiving. Are you freezing yours for Thanksgiving day? I'd love to get some of my baking done ahead of time, and wonder if these will freeze well. What do you think Marion? Your photos are great by the way! 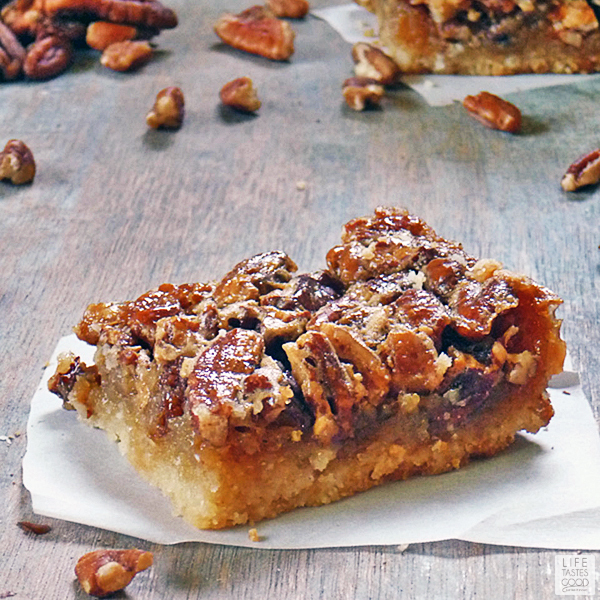 Love pecan pie bars- these look great! I can't wait to try these! Yummy!!!! I am definitely going to try this recipe, and I've already put down the size pan to find. 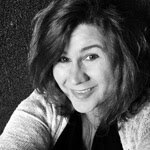 Thanks for your beautiful blog. I also read the one about Melanoma. Well done! And I'm glad that is in the past! OK. Now I'm off to read your other blogs. I love that new one where your recipes will be featured by Mytaste! That's a nice compliment! Wow, this looks amazing! What a smart idea to make them into bars instead of just the regular ol' pie. My dad loves pecan pie, and I bet he would love it if I whipped this up for him. Thanks so much for sharing! I can't wait to try! Thank you, Stephanie! I hope you and your dad love 'em!! I love pecan pie and these just look amazing! Although I'm afraid to make them because I know I would eat them all! HA! That's the problem I had!! They are addicting!! Thanks for stopping by Julie! Have a great week! I love, love, love pecan pie but I'm not much of a pie maker. I think I can handle these. They look fantastic! Nice pics. Love that you turned this classic pie into cookie bars! Love pecan pie bars because you can keep nibbling and nibbling and it still isn't like having a whole slice! Well. At least no one is counting! I had a few issues making these. Part of the problem is I think I didn't have a big enough food processor. Mine is a nine cup, and the shortbread part never turned into coarse crumbs. I added a little cold water, and then just mushed it into the pan and baked it. Taste wise, it was fine. Then for the filling, again, food processor too small, so it started spilling all over the counter and dripping onto the floor (my dog was thrilled!). I still stirred in the pecans, and poured it onto the shortbread, but even with all the spillage, there was WAY too much. I baked it, and it didn't become firm till almost an hour of baking. It was still delicious. I just have to figure out what to cut back on to make less filling. Ooh, I pinned this. Never made a pecan pie because I have been too intimidated by even the thought of it but it is my favorite pie. This recipe I will try! Thank you! Marion These pecan bars look so Delish! I can't wait to make them. The problem I have is that I am not an experienced baker and I don't have a food processor. Can I use a mixer and a bowl for the recipe? I really would love your advice. I’m making this tonight but ran out of corn syrup and had to use an alternative method and miss read the pan size and used a sheet pan. Hope they still turn out! I hope they turned out! Using a larger pan would just mean thinner bars and a shorter cook time, but they should still taste the same. I haven’t tried these with homemade corn syrup. It should work but they might not keep as long due to the homemade syrup as they might harden too much if the sugar crystallizes. I’d love to hear how it worked for you, Stef. Have a super week! !